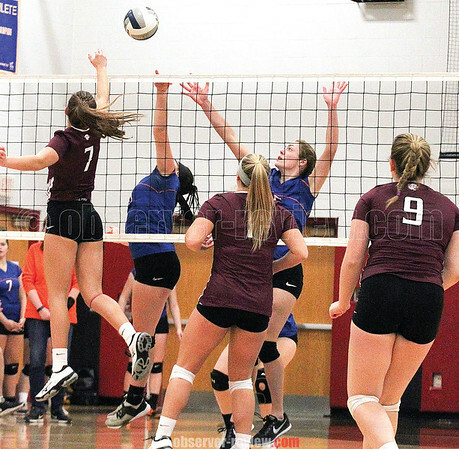 LEROY--The Penn Yan varsity volleyball team lost to Portville, Saturday, Nov. 10, in the Sectional Far West Regionals. The final scores were 25-5, 25-9, 25-11. Coach Eileen Wunder described the defending state champion Portville girls as "a very strong team." The Lady Mustangs beat Warsaw, 25-13, 25-13, 30-28, Tuesday, Nov. 6. Caitlin Wunder posted 16 kills, two solo blocks, and two block assists. Serina Sheradin added 18 assists, six digs, and two aces. Hanna Brodmann contributed three aces, five kills, and six digs. Akiya Brewer had four aces and 13 digs. Peyton Comfort added two kills, one solo block, and one block assist. Kayla Andersen earned one kill, two solo blocks, and one block assist. Lauren Chinski posted two aces, 11 digs and one kill. Two Penn Yan girls varsity cross country runners competed in the New York State Class C Championships, Saturday, Nov. 10, at Sunken Meadow State Park. Joddie Decker took 33rd place, with a time of 20:56.8. Gracie Murphy followed closely in 35th place, with a time of 20:58.8. The two placed amongst 130 other Class C runners from the state. WAYLAND-The Hammondsport varsity volleyball team lost to Bishop Kearney in the regional playoffs, Tuesday, Nov. 6. The final scores were 25-18, 25-19, 21-25, 23-25, 25-19. Shelby Sherman had five aces and 11 kills. Julia Bennett and Erika Hilligus each had 11 kills. Amanda O'Donnell recorded 8 kills. Watkins Glen's Gabe Planty took third in the New York State Class C Championships, Saturday, Nov. 10, held at Sunken Meadow State Park. With the placement, Planty also qualified for New York State Federation Championships on Saturday, Nov. 17, on the Bowdoin Park course, in Wappingers Falls. Planty finished with a 16:28.7 as an individual competitor against 131 other runners.